(Sept. 15, 2014) -- The UTSA Unmanned Systems Laboratory (USL) has flown under the radar since its founding in 2012. Operating out of the UTSA Department of Electrical and Computer Engineering, the USL is managed by Mary L. Clark Endowed Distinguished Professor and Department Chair Daniel Pack, one of the nation's leading teachers and researchers in unmanned aircraft systems, commonly referred to as drones. Pack and his team of undergraduate and graduate students have been making advancements in three primary areas of research: man-machine interfaces; cooperative unmanned aerial vehicles (UAV); and system of systems (how smaller components work together in larger systems). The UTSA team recently was awarded a $300,000 contract from the Office of the Secretary of Defense to study how humans can effectively interact with autonomous aerial vehicles. The goal of the project is to use brain signals of a soldier to navigate small UAVs for military operations such as collecting intelligence, performing surveillance and conducting reconnaissance missions. Current UAVs must have a ground station that relays instructions from a human operator to an aerial vehicle, but ground stations are static and can restrict soldiers and their units from moving freely. 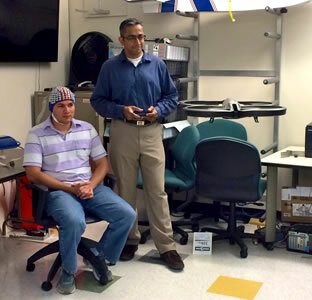 Using new electroencephalogram (EEG) equipment that UTSA recently acquired through a separate Department of Defense grant and working cooperatively with Yufei Huang, UTSA professor of electrical and computer engineering, Pack, Huang and their teams hope to eliminate the need for ground stations by extracting vehicle control signals directly from brain signals of a soldier operating one or more aerial vehicles. "As autonomous UAV technologies advance, it is critical that we understand the governing principles of man-machine interactions to utilize the complementary capabilities of man and autonomous machines," said Pack. "This research will be part of UTSA's efforts toward discovering those principles." While UAVs are heavily used in military applications, they are being used more commonly for civilian operations such as search and rescue, weather analysis and surveillance over land and water. UTSA and San Antonio's Southwest Research Institute are members of the Texas A&M University-Corpus Christi Lone Star Unmanned Aircraft Systems Center of Excellence and Innovation (LSUASC), a consortium of 16 research institutions and private-sector service companies. In June, LSUASC was granted approval by the FAA to serve as a test site for unmanned aircraft. Before joining UTSA in 2012, Pack served in both faculty and administrative positions at the U.S. Air Force Academy in Colorado Springs, Colo., including founding director of its Academy Center for Unmanned Aircraft Systems Research and director of its Sensor-based Intelligent Robotics Laboratory. Pack received his Ph.D. in electrical engineering from Purdue University, his M.S. in engineering science from Harvard University and his B.S. in electrical engineering from Arizona State University. Additionally, he is a licensed professional engineer (P.E.) in electrical engineering. Learn more at the UTSA Unmanned Systems Laboratory, UTSA Department of Electrical and Computer Engineering and UTSA College of Engineering websites.